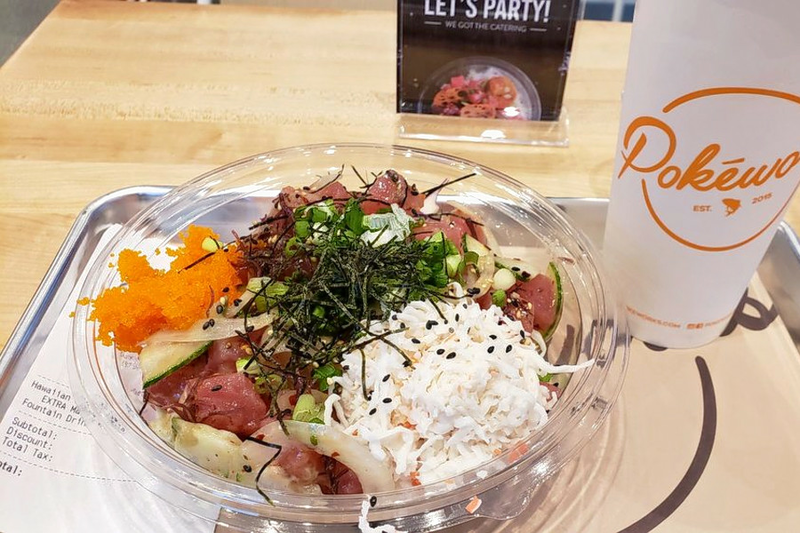 A new Hawaiian spot, offering seafood and poke, has opened up shop in the neighborhood. Located at 122 W. Main St. in Central Park, the newcomer is called Pokeworks. Pokeworks was found in 2015 and now has franchises across the country. The expanding company boasts its collaboration with chef Sheldon Simeon, a former contestant on Bravo's Top Chef and the owner and executive chef of Maui's Tin Roof. At the new Central Park location, diners can begin by choosing a bowl, burrito or salad, then select from a list of proteins -- such a s shrimp and organic tofu. Next, pick from many add-in ingredients like mango and kale. Finally, choose a sauce and more toppings to complete the meal. Alternatively, patrons can choose one of the signature bowls, like the Hawaiian classic bowl, which combines ahi tuna with green and sweet onions, ogo seaweed, cucumber, chili flakes, sesame seeds, roasted sesame oil, Hawaiian salt and Pokeworks' classic sauce. The full menu can be viewed here. With a five-star rating out of two reviews on Yelp so far, Pokeworks seems to be a welcome addition to the neighborhood. Kayla R., who was among the first Yelpers to review the new spot on Oct. 18, wrote, "Wow! This place is great. They have a menu for different types of poke bowls or you can make your own. ... Everything is laid out and easy to see so you can pick what you want." Yelper William O. added, "... Luckily for us all, a Pokeworks is here in downtown Durham! I ordered a Hawaiian classic bowl with extra masago and crab salad on the side. The ingredients were super fresh, from the ahi tuna to the sweet, green onions." Head on over to check it out: Pokeworks is open from 11 a.m.-9 p.m. Sunday-Thursday, and 11 a.m.-10 p.m Friday-Saturday.